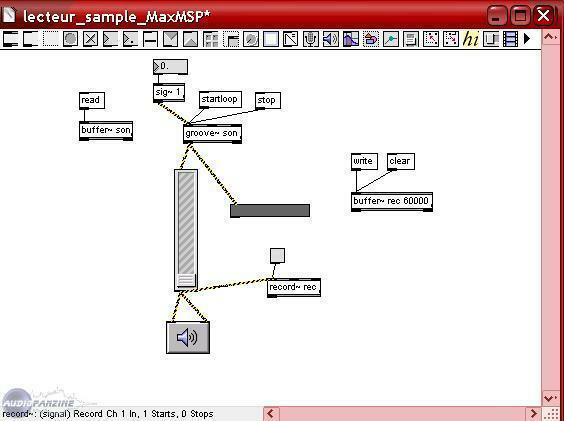 Max/MSP, Environment for audio development from Cycling'74. 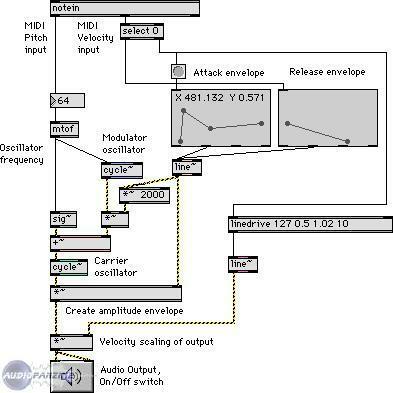 Max / MSP is a programming interface module to create yourself its own treatment system and Midi generations and / or audio (and video with jitter), it allows both to make tt an interactive installation for an exhibition so as to create even the salaries of its virtual instruments or unpublished, these advantages is the fact that it is extremely lightweight and consumes very little cpu (interface rather austere but not displease me). In light of this software knows that patience and limit the imagination of the user who created his "Patches". Installation is no problem ..
No incompatibility with sound cards etc. .. The manual ... there is not strictly speaking, there are however a number of tutorials for Max and MSP, and assistance for each "objects"
and remains unclear on using rewire. The sound is somewhat Max typed it recognizable, after they like it or not. 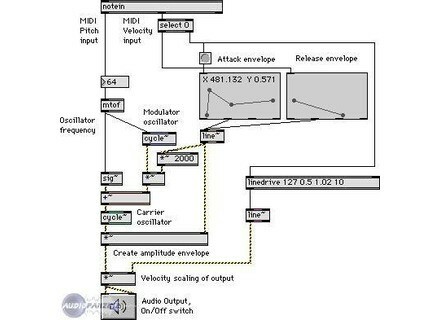 it is obvious that create a drum machine or TB303 DX7 FM synth in Max / MSP can be used to drive but has no interest, it is not to reinvent the wheel but to create his own blend of DSP. 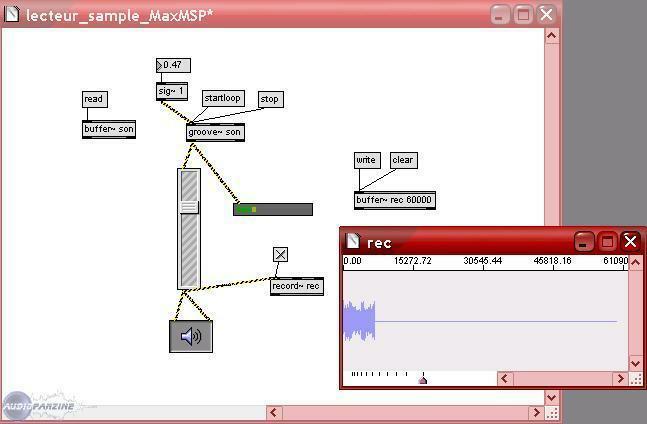 The install of Max / MSP and Jitter (video plugin see below) poses no problem. For toolkits available on the web (and there are a flopped), there is not always install automatically but if you follow the instructions, all goes well. Setup is simple. Everything is DTECT automatically, including the video hardware. Oprationnel IMMEDIATE. Trs little problem of instability. I use it for a little over a month. I am always with BMD ending for me but I'll pay (for Students: $ 59 for 9 months of license). Well, the BMOL is the time it takes. Since everything must be done so-even or nearly so. But I am convinced that it's worth it for those who we REALLY want to manipulate the sound.